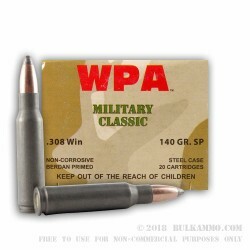 This 308 Win cartridge by WOLF Performance Ammunition features a 140 grain soft point projectile. 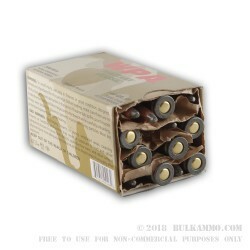 The bullet’s soft tip causes it to expand devastatingly within targets, making this an effective round for taking down whitetail and other rugged game from close to medium distances, as well as for good old fashioned target shooting. This cartridge’s biggest point of interest is its non-corrosive Berdan primed steel casing. While neither its material nor its primer make this casing worth reloading, its more cost-effective construction presents tremendous value to hunters and shooting enthusiasts who’d no intention of handloading in the first place. 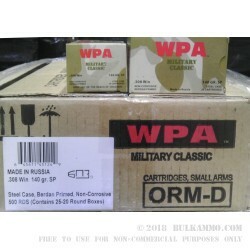 This casing sports WOLF’s proprietary PolyFormance polymer coating, which serves to facilitate feeding and ejection for smooth and repeated shooting. 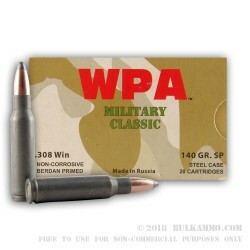 Although an American company itself, all of WOLF’s Military Classic line of ammunition is manufactured in Russia where steel casings are widely utilized.